If it’s time for you to start making your decision about Medicare, there is a lot of information out there you can get lost in. There are some options available to you that can meet your coverage needs. Below is some basic information on your Medicare options. Medicare is available to those who are 65 years of age and have paid into the system for at least 30 quarters through taxes. Part A covers your hospitalization costs. This includes emergency care, inpatient care, skilled nursing facilities, hospice care and other services related to staying in a medical facility. There is no monthly premium for this part. If you are already on Social Security, you may have been automatically enrolled previously. This part covers medical services. This includes the services of a doctor whether its an office visit or their services in another medical facility. It also covers outpatient therapy like physical and occupational therapy. For medical equipment, it does cover durable equipment like hospital beds, wheelchairs, scooters, oxygen tanks. There is a monthly payment for Part B. For 2019, that payment is $135.50 which is set by Medicare itself. The program does have an adjusted income system in order to make Part B affordable to you. When you first enroll, you do not have to enroll in Part B. If you don’t, and change your mind, you will have to wait until the next open enrollment period to sign up for it. If one of these services are something that you will require, or expect to need, there are other options you may want to consider. The Medicare Advantage Program acts as an all-in-one plan that combines Original Medicare and private company supplement services together. Once you go through the process of applying and approval for Original Medicare Parts A and B, you can then contact a broker or the insurance company of your choice to enroll in their plan. Your private insurer will receive and manage your Medicare. A benefit of this program is that your insurance company handles all of the paperwork and logistics of what Medicare pays for, and what they pay for. Another benefits is that your Part B monthly premium is usually wrapped into your monthly premium with the insurance company, so there is only one monthly payment you need to worry about. Also, when the medical staff ask for your insurance card, you only have to show them the insurance card from the private health care company. Another benefit is that this program will act like your current health plan. In the State of Arizona, there are 5 different types that you can choose from. Part D covers prescription medication costs. In order to take part in it, you must enroll for Part D within the open enrollment period. There is a monthly premium if you choose to add this part to your coverage. There are many different plans you can choose from and each one has a different cost to them. When enrolling, those costs will be presented to you. Also known as Medigap, a Medicare Supplement Plan is offered by private healthcare insurance companies. These companies are the same as the names you are familiar with that you see advertised or through your existing employer sponsored health insurance program. The purpose of this plan is to cover what Medicare does not. 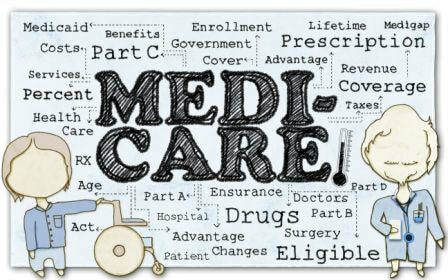 When using your Medicare and a Medicare Supplement together, Medicare will be the primary insurance and be billed first. What Medicare does not cover, your supplement will cover as a secondary insurance. These plans can very as far as the extent of their coverage. Also, when using a supplement program, you will be billed for your Part B premium separately from your supplement program. A benefit is that they are generally less expensive when you compare them to a Medicare Advantage Plan with the same coverages. When you talk to your agent, let them know what services you are looking for and what your State guidelines are. Health Maintenance Organization (HMO): This program requires that you seek your medical care from plan providers. You must also seek a referral from your doctor to see a specialist. Preferred Provider Organization (PPO): A managed plan provider of medical service providers that are within a covered network. You can seek out-of-network providers for different copayments. Referrals are not needed to see a specialist. Private Fee For Service (PFFS): This plan allows you to choose whichever medical service you want. The private insurance provider, not Medicare, set the co-payment prices. Medicare Savings Account (MSA): This is a separate savings account used only for medical cost needs and usually has a high deductible. Once you meet your deductible with the MSA account and possibly your own money, Medicare will then pay for the services within their coverage. Special Needs Plan (SNP): This plan acts like an HMO. It works in combination with Medicaid and is customized for the patients specific long-term needs. In order to qualify, you must be approved for both Medicare and Medicaid. There are many details to these plans that your our advisors can address. Let them know your situation when you speak with them to determine which one is best for you and your spouse. As mentioned before, Medicare only covers the first 100 days of skilled nursing facility care. If you feel that you may need extended coverage, there are State funded Medicaid options or your private healthcare insurance program may have coverage for this as well. Each state has their own rules about this, contact our healthcare insurance professionals about what Arizona’s options are. Everyone’s health coverage needs are different. Navigating through your Medicare options does not have to be a challenge. If you are cautious about having to pay the broker separately, just know that they received their compensation from the insurance company, not from you. Speak to your broker today about what coverage options will fit your needs.